Often regarded as a Greek heretical innovation, in the Protestant West, the popular and scholarly revival of interest in deification declares a return to the foundational understanding of salvation in Christianity before the great schism between Byzantine East and Roman West. The idea and history of theosis is being rediscovered, as a compelling vision of human spiritual transformation into graceful wholeness, that is worthy of serious exploration and could yet be relevant to contemporary Western mystical trends. G. Hallonsten considers that the recent publication of an English translation of Jules Gross's classic on divinization according to the Greek speaking Fathers, as 'just one sign' of this renewed interest. According to Dr. Norman Russell, the eminent patristic scholar and expert on theosis, "The remarkable revival of interest in theosis, or Christian deification, has been driven to some extent by an evangelical concern to find new ways of speaking about the transformatory power of the Christian life. Kenosis, or self emptying, which St. Paul used to describe Emanuel ministry for the universe, ends into Theosis, partaking of the nature of God as St. Peter described in his second epistle. The words of Clement of Alexandria became the reference passage, "The Word of God became man that you may learn from him how man may become God." St. Ireneus was the first of the Church Fathers who iterated it and St. Athanasius has popularized this cornerstone belief. Theosis was elaborated by the Alexandrine fathers, and used extensively by St. Cyril in his theological debates with the Antiochians using the hypoststic union Christology. This theme of the Orthodox Church was avoided in the west, until Karl Rahner and Hans von Balthassar have come so close to the language of the Alexandrine Church. Kenosis, or self emptying was mentioned four times in this book within three essays, first by A. Louth, and twice in an essay on Russian Theosis of Sergius Bulgakov. Dionysius p-Areopagite was also exposed by A. Louth in a chapter 'Transformation, The Human Dimension of theosis'. In his conclusion he relates the centrality of deification in Orthodox theology as a counterpart to the doctrine of incarnation, which was the thematic approach of a Coptic bishop in medieval Egypt. The human side of theosis in such cosmic dimension witnesses to the transformation in responding to the encounter with God offered in Christ through the Holy Spirit. This collection of papers, given at a conference on theosis held at Drew University in 2004, tracks the concept of partaking of the divine nature, as 'Christian deification,' known in Greek as 'theosis' or 'theopesis' as utilized alternatively by St. Athanasius, in a critical historical analysis. The doctrine of theosis goes back in Christian thought to Origen, and his Alexandrine disciples Macarius, Athanasius, and Cyril who defended the soteriological work of Jesus Christ as a divinizing work of grace. Recently theosis became very much a topic of theological discussions, outside the Eastern Orthodox Church domain. Some of the work of its contributing members was published earlier in "Theosis: Deification in Christian Theology," edited by Vlad Kharlamov and Stephen Finlan, who drew my attention to this valuable collection. This supplementing volume covers a wide variety of studies with an emphasis on theosis in medieval times, Reformation and modern thought. Several outstanding scholars, including Andrew Louth and John McGuckin, who have been engaged for some time in the study of theosis, contributed valuable essays. Throughout its five sections, that first review the broad issues linked to the nature, biblical basis, and theology of the doctrine of theosis is elaborated on by sections on conceptual development from late antiquity to post modernity, considering the change and discontinuity of this Christian concept as the intellectual history of an idea. Now, that I selected a unique study on Medieval Coptic theology, I have been introduced to Bishop el Bushi (1170 -1250), by Dr. G. Bebawi, Cantab Coptic scholar, only few years ago, when a recent resurgence of theosis debates started in the Coptic Church. In a compelling study of medieval Coptic teaching on Theosis, through exposing el Bushi's 'Treatise On the Incarnation,' Dr. Stephen Davis, of Yale Divinity, and an expert on the Egyptian Church in Late antiquity tackled a rare and inspiring subject on the church of the Martyrs, under Islamic siege for half of a millennia, yet renewing one of its controlling doctrines, a century before G. Palamas even thought to borrow the concept from Denys Areopagite during the Hesycast controversy. El Bushi sacramental theology, reflects the Coptic hermeneutical tradition and sacramental enactment of its Christological doctrine, in his masterful approach to divinization, "Whoever partakes (of the Eucharist) in a worthy manner and with faith, God resides in him and gives him the life that He gave to the body united to him." This review is a talking of gratitude to few of my mentors and friends, who enriched Dr. S. Davis essay, of whom four are mentioned: late Fr. G. Anawati, OP, late Dr. A. Atiya, Fr. S. Khalil, SJ, and Dr. J. Faltas. 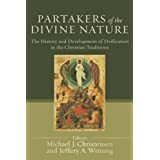 Want to learn more information about Partakers of the Divine Nature: The History and Development of Deification in the Christian Traditions?